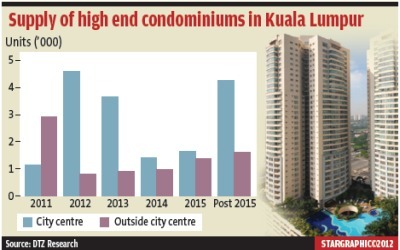 PETALING JAYA: With close to 2,600 high-end condominiums scheduled for completion in Kuala Lumpur this year, the outlook for the luxury condominium market in the capital city is expected to be challenging. 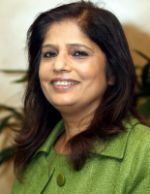 “Bank Negara is keeping a close eye on the mortgage loan market on concerns of rising household debt-to-gross domestic product levels and has issued new guidelines to further tighten lending with effect from Jan 1,” said property consultancy Knight Frank, in its Second Half 2011 Real Estate Highlights report. Concurring with the bearish outlook is DTZ Research. In its Property Times Kuala Lumpur fourth-quarter 2011 report, DTZ pointed out that the sizeable number of new condominiums entering the market about 5,004 units in 2012 and another 4,502 units in 2013 was expected to put downward pressure on the rental market, especially in the Kuala Lumpur city centre, as a majority of them are in this location. “The rental market will continue to feel pressure from the significant new supply that will be completed in the next two years. In addition, the economic uncertainty and tightening of credit by banks will contribute to the cautious demand for luxury residential properties,” Property Times added. The Knight Frank report said during the review period, prices and rentals of high-end condominiums in selected schemes in Kuala Lumpur and the city fringe continued to face downward pressures due the high number of existing supply and new completions as well as a weak leasing market emanating from low occupational demand from local residents and expatriates. The projects that are scheduled for completion this year include Residensi Kia Peng, The Pearl @ KLCC (formerly known as Stonor 16), Crest Jalan Sultan Ismail, Setia Sky Residences Phase 1A (Boheme Tower), St Mary Residences, Verticas Residensi (Towers A, B and C), Suasana Bukit Ceylon, 9 Madge, Amarin Wickham, Gaya Bangsar, and Matahari Desa Sri Hartamas. Recent upmarket condominium projects that have been launched included Verdana @ North Kiara (Phase 1), Icon Residence Mont'Kiara, Mirage Residence, Laman Ceylon, 188 Suites, St John Woods Residence, Rimbun Condominium (formerly known as Amphill Residence) and Platinum Suites Phase 1 of Platinum Victory Face project. Other projects in the pipeline during the first half of this year include serviced apartments project KL Trillion, Royce Residence, SoHo units @ Arcoris Mont' Kiara (formerly known as MK 20) and Damansara City 2 serviced apartments. In the primary market, developers continued to offer attractive incentives such as rebates, discounts and a limited period of free maintenance fees to drive sales. There was also a notable shift with more sales and leasing activities in the city fringe and suburban areas evident from several successful previews and launches of high-end condominiums at new benchmark prices commensurate with higher building specifications and improved level of facilities. There was a lot of talk late last year that property prices will tumble in 2012 after the steep rise in the residential sector over the past few years. So far, we have not seen any of that. Developers are offering very enticing terms since the beginning of this year. Keep your finger on these three factors and let us now take a look at today's launches. In some of these launches, buyers need only to pay about 1% downpayment of the property price instead of the required 10% on signing of the sale and purchase agreement. The stamp duty and legal fees are also waived and they need not pay anything else until after the property is completed. Such schemes have attracted many buyers. The question to ask is: If the market is as good as many claimed it to be, why are developers offering such schemes? When a property is sold, it is registered as a sale. But the absolute revenue of the unit is yet to be paid. For easy calculation purposes, 10% of a RM500,000 property is RM50,000. If the first 10% is paid, this RM50,000 is registered as revenue by the developer, but in the sales column, a sale of RM500,000 is recorded. That is why the sales and revenue figures vary considerably. If a developer allows a buyer to pay only 1% of the purchase price, this does not mean he “loses” that other 9%. He will get it back after a certain period of time. The same goes for the waiver of the stamp duty and legal fees. The developer has to pay the lawyers for services rendered. All these charges and fees are packaged into the deal which the buyer will have to bear in due time. In this case, later rather than sooner. Developers are offering such attractive terms in order to make a sale. Many of these schemes are offered in condominium projects because there is generally a glut in this segment. While such schemes may attract genuine buyers who need a roof over their heads and who are thankful that they can defer payment, it also attracts those who have no problem forking out that 1% downpayment and take a gamble that they will be able to offload it when the project is completed. If one were to drive around certain parts of the Klang Valley today, there are some completed high-rise with large mobile numbers plastered on windows. It may not be so easy to offload units when there are so many of them. What is noticeably absent, and which many would like to see are more launches of landed housing. But this is unlikely to happen. Only the secondary market is offering landed units, which may explain to a certain degree why the secondary market was rather robust last year. It applies not only for the Klang Valley, but for Penang as well and is a reflection of strong domestic demand despite the many negative predictions for this year. When a developer considers a piece of land, he thinks of how much he can make from it. If he were to build a condominium and throw in various facilities, he can sell more houses than if he were to build landed units. That is why most of the launches today are high-rise projects, be it condominiums or serviced apartments. Developers are also limited by what they have. Increasinlgy, land in city centres and popular areas are getting smaller. Which explains why in highly dense areas, condominium projects continue to be sprout up in the most congested of areas. The development of landed units can only take place when there is large tracts of land, which also explains why the big boys like Mah Sing and SP Setia are venturing further away from city centres. The other obvious factor in today's launches are the size and price of the condominium units. Most of the units are small. Studio apartments may be in the 500 sq ft range or thereabouts while those targeted at families may be three-bedroom units with built-up areas of 1,200 sq ft onwards. Most of the launches today are priced close to RM700,000 onwards. On a per sq ft basis, the price is still going up, whether it is a Petaling Jaya address or a Bukit Jalil one. So, while sales volumes may stagnate in newly-launched projects (which explains why developers are offering units for sale with a 1% downpayment), on a per sq ft basis, prices does not seem to be stabilising. Developers are trying to maintain affordability by having smaller units, deferring payment and leveraging on low interest rates. Assistant news editor Thean Lee Cheng is glad that Bank Negara is monitoring the household debt and lending in the property sector closely as this year promises to be an exciting one. KUALA LUMPUR: Parkson Holdings Bhd, a Lion group company, will invest some RM3 billion to develop a chain of 10 shopping complexes by 2020. The development and management of the mall, which will be under Festival City Sdn Bhd, will open in major cities within the country and carry the Festival City brandname. Group managing director Datuk Alfred Cheng this is a natural extension of its enormous retail experience and to create a new and steady source of income. “Parkson is in its 25th year of operations and has a lot of retail experience. In some of our overseas operations where we occupy a larger area, we are already operating a ‘pseudo’ shopping malls. So, we already have experience running malls and this is a natural extension,” he said. Cheng explained that it used the word “pseudo” as it already has seven malls in China where Parkson is the main occupant with smaller retailers. “The focus (previously) was to build a network of Parkson (department store). Now that we have achieved more than 105 stores in Asia, we feel ready to also venture into shopping complexes,” he said. “Within the next three years, we expect to have two more malls and, within 10 years, 10 malls in total in Malaysia,” he said. 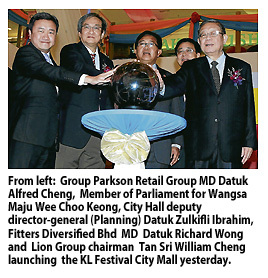 In a recent interview, it was reported that Parkson was finalising a second mall that will be located in Malacca. “Each mall will cost between RM250 million and RM300 million on the average or maybe even a little more,” Cheng told Business Times following the official launch of the first mall. “We will only be in major cities for a start,” he added. Cheng also did not discount the fact that it could buy an existing mall but said that it would focus on developing its own mall. Parkson Holdings is the majority shareholder in both Hong Kong-listed Parkson Retail Group Ltd and Singapore-listed Parkson Retail Asia. The former listed entity covers the retail operations in China, while the latter covers operations in Malaysia, Vietnam and Indonesia. Meanwhile, Cheng said KL Festival City will post a earnings before tax and interest of RM20 million in the first year of operations. The mall's tenants are expected to rake in a total of RM300 million in sales in during the same period. KL Festival City, whose theme is "Every Day is a Celebration", is a 1.1 million-sq-ft mall with a total net lettable area of 500,000 sq ft.
Shares of Parkson Holdings yesterday rose 3 sen to close at RM5.56. The stock's price has fallen by 1.77 per cent so far this year, compared with the benchmark FTSE Bursa Malaysia Kuala Lumpur Composite Index's 3.15 per cent rise.